Comics Should Be Good: Exactly what happens when you experience a time-mind sync-warp? Exactly what happens when you experience a time-mind sync-warp? I teased you with the worst experience you can ever ... uh ... experience, and you demanded to know what happens next (by "you" I mean commenter Doug M.). So, enter the world of the time-mind sync-warp ... if you dare!!!!! As "Anonymous" pointed out, first, Drax will "be assaulted by fists of shattered illusions and broken promises!" But that's just the beginning! Sinister ghosts of past deeds and grim threatening spectres of future evils will then menace you! And you'll be forced to relive over and over that time you dressed up as Carmen Miranda and pranced around the bedroom singing "I'm A Little Teapot" just to see what it would feel like! If you think the tough part is over, you're a fool! Not only will Thanos swallow you, but then he will create your prison, "and your prison is MADNESS!" Luckily, it can't get much worse, can it? Well, only if you think this is better! Remember: this story came out when Grant Morrison still thought "Sesame Street" was cutting-edge! 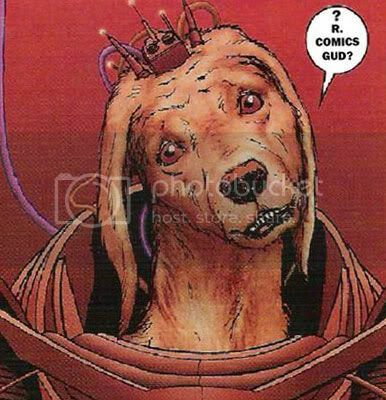 Is this the weirdest page Marvel has ever published? 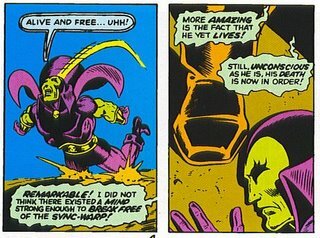 All this almost wipes out the psyche of Drax the Destroyer. Think of what it would do to your puny minds! What have we learned? Don't piss off Thanos, obviously. And was Stan Lee just walking around the Bullpen handing out tabs of LSD? Now that's a workplace! That's some insanely awesome dialogue. Did Thanos recent series have that kind of dialogue, because if so I'm going to have to go searching for it. "One must not get too carried away with this 'Doing the right thing' fatuousness." Other than that, the first six issues are a pretty passable cosmic story in the Starlin vein with some pretty clever turns. The Giffen stuff turned me off after 2 issues worth. Trippiest panel ever? Uhm, it's close. Keep in mind you're talking about an arc where Mar-Vell gets lectured about how bad war is by a giant tree with a big eyeball and attacked by his dead girlfriend. For which he gets to go blonde. Yeah. 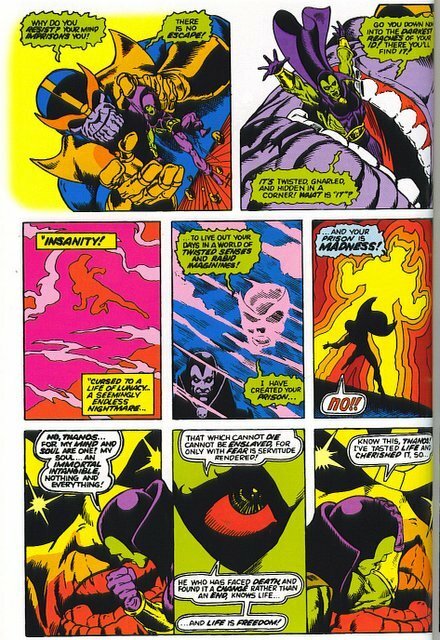 My vote for trippiest sequence has to be the "clown issue" of Warlock, though. 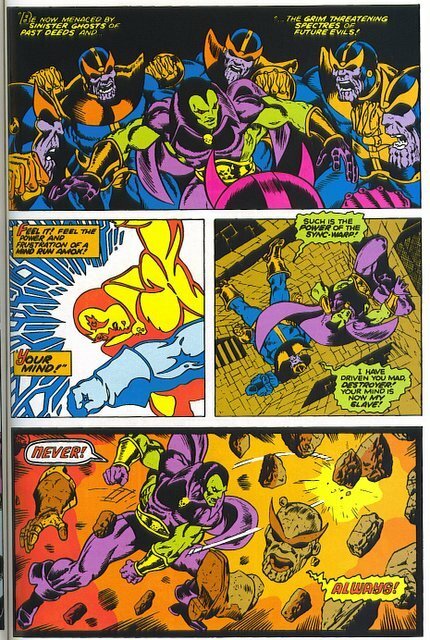 Jim Starlin nailed to a cross and being hit with cream pies. And that's how it starts. I've said it before and will again: Man, Jim Starlin. Who do I have to bribe to get a poster of that page?!? That's just pure awesome in a can (or at least on a page). I need to find more seventies Starlin stuff, I've only a few scant issues here and there. Here's the funny thing: I don't remember the first pages of that sequence. But I /totally/ remember the last one. Right down to the lizard-thing climbing into a hole in one panel and out of the hole several panels previous. And that's after, what, thirty years? N.B., Starlin was not always that good. In fact, most Starlin after the mid-'80s is pretty awful. But when he had it, he had it. 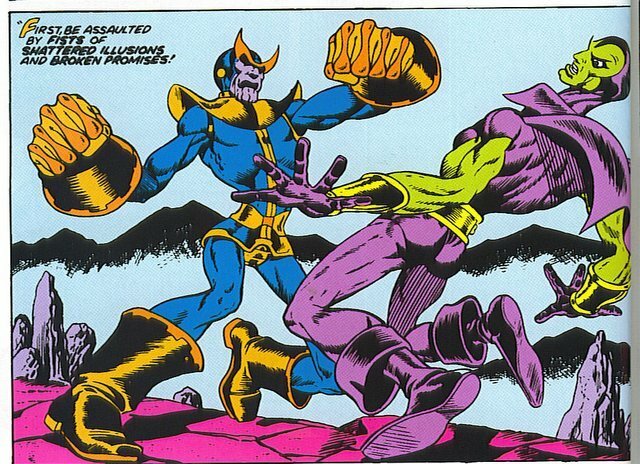 I grew up on the Infinity Gauntlet Thanos, who's pretty much a by-the-book villain. But if they had a series dedicated to this insane ranting guy that constantly brags about how awesome he is while kicking people's asses with psychadelics it'd be an awesome hit! 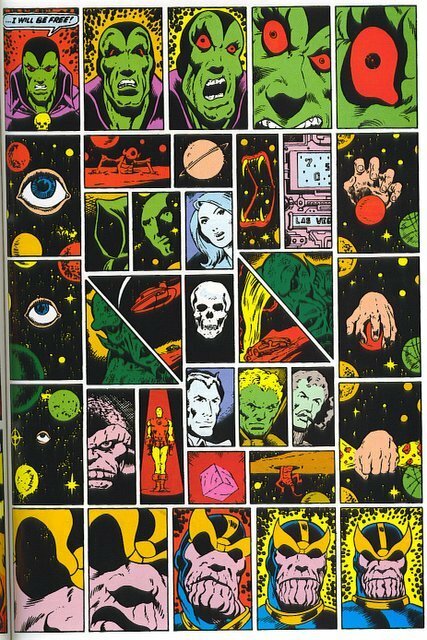 Could Starlin draw Orgasmic Ditko Faces or what? That is some prime Starlin right there. JR: This is from "The Life & Death of Captain Marvel," which should be at all fine comic book stores everywhere. I collects Captain Marvel #25-34, an Iron Man issue and a Marvel Feature issue, and the Death of Captain Marvel graphic novel, which came out ten years later and features rougher and a little better Starlin art. It really is a magnificent piece of groovy comics goodness and can be yours for $25 (or less, I suppose, if you can find a bargain). Man, you don't see colors like that anymore. I'll take that over the dark, smudgy-looking "realistic" art you see a lot these days. Thanks for pointing that out to me Greg! Amazon seems to have it for 15 and change, but I'll do some local browsing too. I just got this book (for free!) a couple of weeks ago, and I must say that while it is indeed trippy freaky Starlin goodness, it's best to take it in small doses. My sad little mind is still crying just a little from all the crazy. What was The Thing and Iron Man doing in that last scene? that thing is just out of this world, this guy mos have had LSD, Mushrooms and Salvia or other hallucinogen to picture this. I was really searching for this kind of article.I really want that.You truly help me out. Really great post, Thank you for sharing This knowledge. Excellently written article, if only all bloggers offered the same level of content as you, the internet would be a much better place. Please keep it up!!! These are some one of the finest comic books. Thanks for reminding it. Very cool website!! Man ..Excellent ..Amazing .. I will bookmark your website and take the feeds also…I am satisfied to find so much helpful information here in the post. Thank you for sharing.. If a term has an amorphous definition that is basically shorthand for "bad writing," then it just isn't effective enough. These data helps me think of some as valuable things, keep doing awesome. I experienced childhood with the Infinity Gauntlet Thanes, who's practically a by-the-book reprobate. Be that as it may, in the event that they had an arrangement committed to this crazy raging person that continually boasts about how marvelous he is while kicking individuals' rear ends with psychedelics it'd be a magnificent hit! My favourite comics are those which connected to Marvel and DC. I'm waiting for every movie that goes from Marvel or DC. A few weeks ago I had to write my discussion board post on the topic of favourite movie and of course, it was Justice League from DC. 0802jejenike basket basse homme L'empeigne synthétique nike dynamo free rakuten comporte un chaussures new balance course pied support solide. C'est chaussure nike bebe blanche très brillant avec asics lyte blanche femme son aspect asics bleu pas cher visuel frappant New Balance 993 Baskets et son caractère nike air huarache homme solde influencé semble être. The Nightmarist - What Is The Question? Why does DC want me to gouge my own eyes out? Does this Quesada point make sense? Comic Book Urban Legends Revealed #50! No, sweet Jeebus, no! Anything but that!